This photo was taken on April 29 2012 at mid day . The location was in my backyard in Bethesda, MD. The "Take It!" came from a little tour of my back yard in conjunction with shooting some photos of the chaise with rhododendrons. I had planted this apple tree along with another last spring after a laughable disaster which was of my own doing. Before getting into the details of the laugh I want to let you know these are Honey Crisp apple trees, which yield in my experience, one of the best tasting apples one can find. They are sweet but not overwhelmingly so. One of the best features about them is their juice yield which almost requires one to savor and keep on drinking the juice as one is chewing the apple after having taken a big bite. One actually in time judges what size bite to take in order to accommodate this set of steps without being overwhelmed by having the need to do some clearing of the juice while still busy with the chew part. I must also say the consistency of the crunch is just right for this consumer. The trees have these little apples on them which is one of those miracles of nature for last year after planting them, they produced nothing. They survived to get to this point for which I am grateful. What happened last year when I bought them? I brought them home from the nursery and put them in my side yard as a staging point for a nice day to plant them. It was in the early spring thus the weather was a bit on the cold side; therefore there was no immediate inclination to get out and dig in the dirt. Along came a weather report calling for freezing temperatures for several days which I thought just might kill these very young trees which did not have their roots in the protection of the soil via planting. I decided to bring them in the house and place them in an unused bedroom until the weather became more favorable for planting. The trees were about 6 feet tall and in plastic pots with a weight of about 50 pounds each. They went into the bedroom with the thought in my mind that it was going to be a very nice day when I would go though another move of these things. I got busy with other things and did not really think about them as we were not having any of that kind of weather. Then for what reason I do not know, I went into the bedroom and found the trees had almost completed their blossom cycle as it was so warm in the house. The cycle was far enough along that most of the blossoms had actually fallen on the floor with just a few remaining on the trees. The rush of thoughts that hit me was a fun exercise. Yes the trees had made it through that bit of cold spring but now because they had not had the advantage of being pollinated, they might not bare any fruit. Very soon the outside temperature warmed up and the trees were planted using the recommended soil enhancer's etc and they went fruitless through the summer. 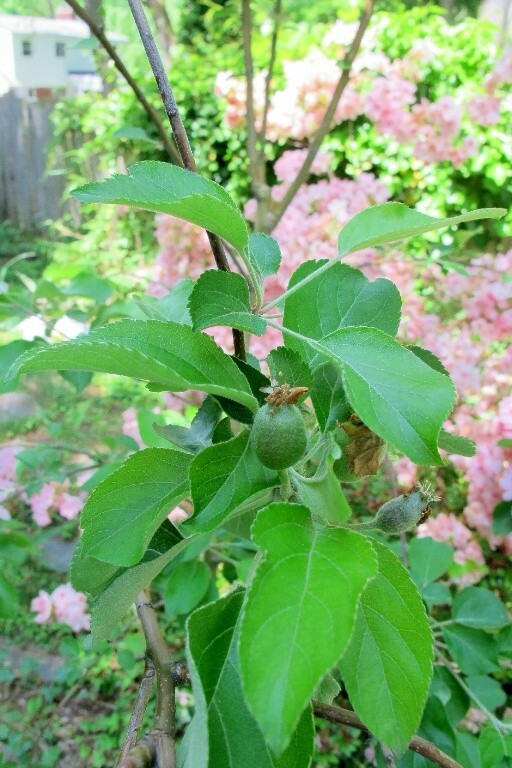 I will take pleasure sharing periodic updates via photos as the growth of these apples take place. In the meantime, I would like to encourage each of you to watch for these apples to come on sale at your grocery store and give them a try. My hope is that you like them as much as I do and will add them to your inventory of treats for when they appear at your local store. The After Take: is waiting to be written but is full of promise. Again with hope that it is with a rare chance to have a multi dimensional share with a feast for not only our eyes by a treat for our taste buds as well. I cannot close this without giving my very special thanks to the neighborhood bees who seem to have done a great job. Sorry to have denied you the chance at what must be a nectar treat last year. Thanks for joining us for the current photo presentation. You are cordially invited to return Friday, June 1st for a new picture that we hope you will enjoy. Apologies for the photo mix up this week folks. Our designer employed a new technique that requires a little bit more fine tuning. They don't look edible but I wonder if they are. Those trees will have a huge pay off for you in the years to come. I made a bit of a typo. I initially called them Honey Delicious Apples, but they are actually called Honey Crisp Apples. Very big apologies to anyone who went looking for Honey Delicious Apples.